is generated each year in Australia. How are you handling yours? Save on man and crane hours. Remove waste efficiently – even if your site has limited access. Multiple chutes make sorting recyclables or moving stock in your factory effortless. Multiple entry points on the drop allows simultaneous loading from different levels. Lockable doors on hoppers; anti-spill side guards; warning signage. WorkCover approved system. 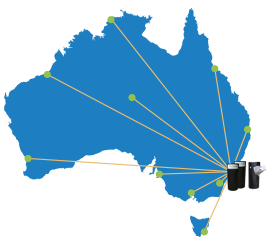 All of our products are all manufactured right here in Sydney. We source locally made materials and outsource necessary processes to other local small businesses. Aussie Chutes Hire and Sales service Australia and around the world. 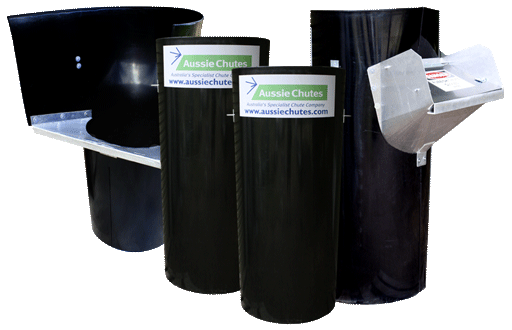 If you have a small hire job outside of Sydney, we can help source a supplier of Aussie Chutes closer to you. Aussie Chutes was established in 1989 and was the first and only rubbish chute company in Australia to be WorkCover approved. Originally started to fill a gap in the market, Aussie Chutes is now owned and run by the second generation of the same Sydney family. We pride ourselves on being locally born and bred totally Australian made. Over the years we have developed our product, increasing size, strength and safety, enabling us to service higher and higher buildings, (20-30 floors). We have a small team of dedicated and knowledgable staff who are happy to talk to you in regards to tricky sites and custom jobs.